Fermented kimchi is an easy, tasty, healthy dish. Learn how to make it yourself at home. Total Time: 15 minutes for preparation. Two sessions of resting to ferment: varying lengths of time. Cut the cabbage lengthwise and remove the core, then chop the remaining cabbage into one-inch strips. Place cabbage into a glass bowl and sprinkle with salt, mixing it together with clean hands. Cover salted cabbage with cold water. Cover with plastic wrap. Let sit at room temperature for 4-24 hours. Note: You may need to place a weight on top of the cabbage to keep it completely submerged under the brine. Drain the brine from the cabbage. Reserve brine. Place remaining ingredients in large bowl and mix together. Add cabbage to bowl and toss with clean hands. Repack cabbage into individual glass jars with lids, packing tightly and adding brine if necessary to cover. Leave about one inch of space. Allow to ferment at room temperature for 1 to 7 days, depending on your preference. 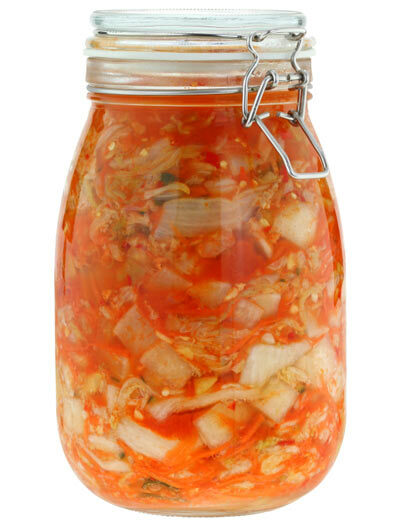 Refrigerate once kimchi is at desired fermentation level. You can use any vegetables you like for kimchi: cabbage and daikon radish are simply the most commonly used. You can adjust the spice levels up or down for your personal taste, to range anywhere from zero (this would be consistent with sauerkraut) to very spicy. You can also add fresh chilies such as jalapenos or serranos and reduce the amount of chili powder or sauce used. Use salt that is free of iodine and anti-caking agents because they can inhibit fermentation. Only use filtered or spring water free from chlorination because chlorine can inhibit fermentation. You can substitute the Korean red pepper powder with the same amount with a hot sauce such as Sriracha if you prefer. For a vegetarian version, you can substitute the fish sauce with either kelp (3/4 teaspoon kelp powder in 2 tablespoons of water) or 2 tablespoons red or white miso paste. The microflora that grow in kimchi thrive on sugar, so adding some to the fermentation process helps to provide "food" for the microbes to eat so they grow and provide you with all of their benefits.